If you ever want to start stressing about the weather, you can either 1) plant a garden or 2) rely on pastures for your horses. I know this because I subscribe to both categories. According to the local news, our last rain was seen in the area on April 1... earlier in some areas including where we are. Because of that and the Eastern NC heat, I have had to water our gardens religiously and sit back and watch our pastures struggle. This time of year I typically only have to feed our horses hay when they are in their stalls or confined to the riding ring due to too much rain (which is sand footing, and I put them on to let them move around instead of letting them make the pastures into mud pits). However because the lack of rain is keeping our pastures from producing anything more than dust, I'm back to feeding hay around the clock. During the last few weeks, every threat of rain has skirted around us. I've found myself hoping and wishing and doing rain dances to encourage some kind of precipitation (the latter effort accompanied by a few glasses of wine) but the showers missed our farm by mere miles every time. Until last night. 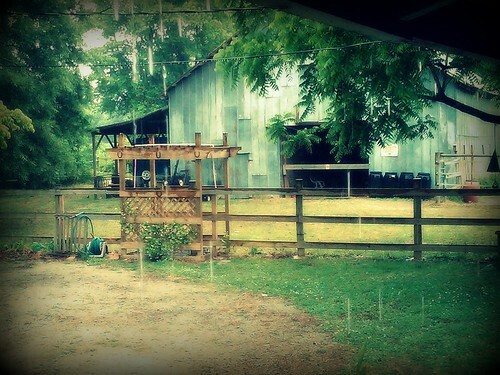 I can't remember the last time I was so happy to see the rain. It's amazing how preoccupied my mind got with it when I had gardens and pastures that were struggling. And of course this mini-drought would come this year when I've decided to produce as much of our own food as I can. Ahh, the pressure nature has been putting on me! So unlike some, I have thoroughly enjoyed this rainy Monday. Every shower that started made me smile and look out the windows. I even found myself wandering outside tinkering with things while it was sprinkling earlier and not caring when I came in the house soaked. I'm not sure how much rain we've gotten so far -- its mostly been a light on and off again rain for the last 24 hours -- but every bit of it is being soaked up as fast as it falls. I haven't seen one puddle yet.